A lot of girls, including me, dreams for the perfect bridal outfit at a young age. As we grow up, we realise that the Indian Bridal makeup serves as a make-or-break part too. And it’s every bride’s wish to go everything as planned on her big day. 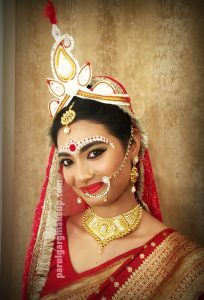 Whether you are a South Indian bride or a North Indian one, different makeup looks are trending at present. Muslims generally hold their weddings in the evenings. 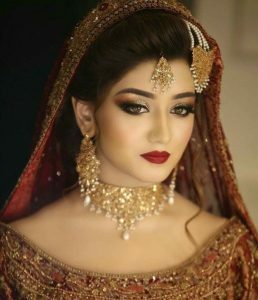 The complete focus of Muslim bride makeup is on making her eyes glittery and appealing. The makeup artist does the makeup using shiny shades. Head ornaments and hairstyles are also an integral part & they complete the whole makeup look with the traditional nosering. Also, the makeup involves heavy contouring & highlighting too. 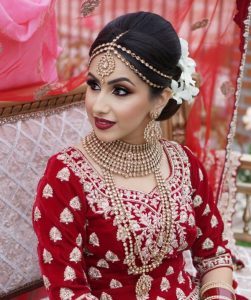 A Bengali bride makeup look features firstly a bold red lip, tons of blush, a sharp winged eyeliner to highlight the bronze-hued eyeshadow. Secondly, strong well-defined eyebrows and heavy, luscious eyelashes to enhance those famous Bengali almond-shaped eyes. The makeup compliments traditional Bengali bridal adornments like the Chandan bindi designs that are drawn on the forehead. 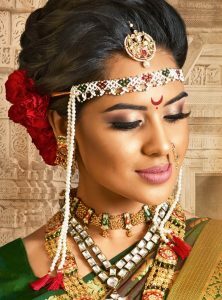 The bride’s makeup includes moon bindis, dark green nauvaris & traditional Mundavalyas framing the face come together to create the traditional Maharashtrian bride look. So, makeup artists lightly buff eyebrows, slightly coloured eyelids, which all over enhances the bride’s natural glow & beauty. 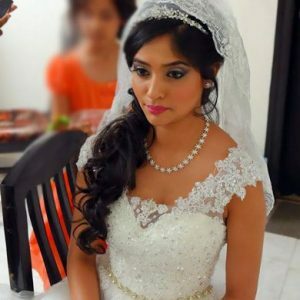 The new-age Indian Christian brides these days have a touch of the west and east in their bridal looks too. 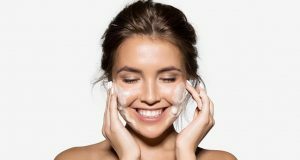 Therefore they keep the makeup look soft & as natural as possible. 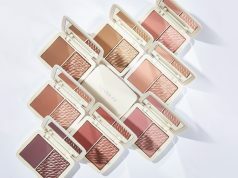 Without too much shimmer and glitter on the face, they keep the base dewy. Since the Indian Christian bride wears a white dress, her eye makeup for the church blessings is light & subtle. Nothing is as happening as a Punjabi wedding. This look focuses on the eyes giving it a dramatic look. Usually going for a pink makeup look to match the light coloured ethnic wear. In conclusion, considering all the traditional India bridal makeup, the smokey eye goes with Punjabi makeup that is dramatic and colourful. Next articleI Tried The Maybelline Tattoo Brow Gel Tint, And Well….